This is a very unique and beautiful centerpiece with two hanging votive chandeliers. Glittering acrylic crystals and curving lines make this piece sparkle. Get the elegant look of cut crystal without the cost! 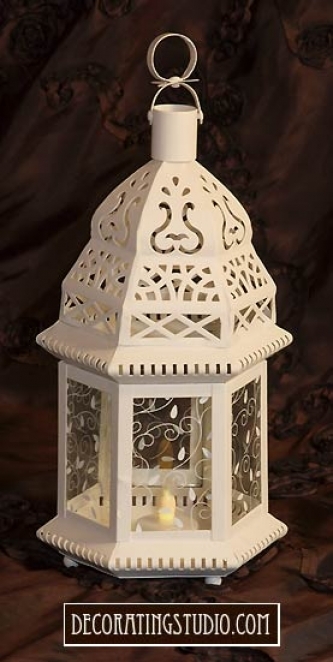 This ivory painted metal centerpiece is perfect for use for a wedding table decoration. uses votive candles Metal and glass with acrylic drops. 13" wide x 6 " wide x 17" tall candles not included. Gracious curves with warm amber glass add a strikingly sensual appeal to this three-tealight candelabra shaped like a graceful calla lilly plant. When the soft amber glow of candlelight is added to this elegant Art Nouveau sculpture it glows for a truly stunning display! Iron with glass and acrylic accents. Candles not included. 9 1/2" x 4 3/4" x 13 1/2" high.